Taiwan and the coastal states of the ASEAN have 9 different points of dispute concerning maritime boundaries. Of these 7 involve China, and at least 5 states are affected in all but 2 of the disputes with China. China is averse to multilateral discussions and insists on dealing with each state separately so that it can extract the most advantage. China’s Historic Rights: The Court ruled that the provision of comprehensive and exclusive rights by the UNCLOS had extinguished historic rights as they were incompatible with the concept of exclusive economic zones. Maritime Features and Maritime Entitlements: The Court found that some reefs had been heavily modified by construction and land reclamation. None of the features were capable of sustaining inhabitation in their natural state; therefore they could not have an EEZ, but only a 12-mile territorial limit. Unlawful Actions by China: The Court found that China had violated Philippines rights by interfering in with its fishing and oil exploration, constructing artificial islands, and allowing Chinese fishermen to fish in the Philippines EEZ. China had also caused great harm to the marine environment by destroying reefs and depleting endangered species such as sea turtles. The Court found that China’s actions were incompatible with the the obligations on a while dispute resolution proceedings were going on. China has clearly suffered a setback with the Court of Arbitration so explicitly declaring it a violator of the UNCLOS, and upholding Philippines position. It is quite evident that the dashed lines have no validity and that seems to knock the bottom out of China’s case. 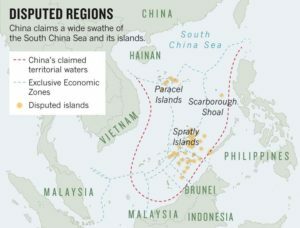 This does not mean that China will resile from its present claims in the South China Sea. Its whole aim there is to acquire the rights to exploit sub-sea resources, particularly offshore oil, and its likely reaction can be predicted. It will harden its position, condemn the Arbitration proceedings and reject the findings (which it has already said it would do) and adopt a tougher and more belligerent posture in its dealings with the USA and the ASEAN, which is already dubious about long-term security support from the US. It may respond to its legal and diplomatic failure with military bravado. It may well become more hard-nosed in its dealings with India, for instance in the border issue and in trade. Such a reaction will be of a kind with its method of international policy, such as its aggressive postures with Japan over the Senkaku islands, or the ordering of the ADIZ over East China. The softening of the US towards China has in a sense contributed to matters reaching near-crisis. America has been aware for more long about the construction and land reclamation in the South China Sea, but its response has been muted, as it is not ideally placed to demand adherence to the Arbitration Court’s findings, not having itself ratified the UNCLOS. China’s long-term aspiration, however, is to gain status and assert its place at the global “head table.” This it cannot do if it continues to behave like a maverick. It has to return to its professed policy of a “harmonious rise” This will only happen if the world community takes a firmer stand on its conforming to international agreements. Vice Admiral RN Ganesh (Retd.) has commanded a diesel submarine, a nuclear submarine and the aircraft carrier INS Vikrant. His last appointment was as the Director General of the Indian nuclear submarine programme which he continued to head after retirement from active service till 2004. He is adjunct faculty, ISSSP, NIAS.